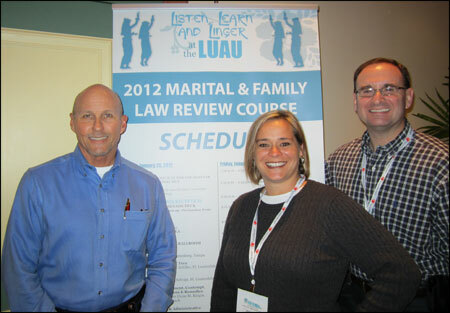 Attorneys Paul Rice, Phil Bonamo and Jackie Roys (pictured here) attended the annual two day Marital and Family Law Board Certification Review Seminar at the Loews Royal Pacific Resort at Universal in Orlando, Florida on January 27th and 28th of 2012. Almost thirteen hundred divorce and family law attorneys from around the State of Florida attended this seminar to learn about the latest developments in legal topics such as equitable division of marital assets and liabilities, alimony, prenuptial and marital settlement agreements, parental responsibility and timesharing of children, parental relocation of children, child support and various issues relating to jurisdiction, practice and procedure. This seminar also serves as a review course for attorneys who are preparing to sit for the test to become board certified in marital and family law. Paul Rice has been board certified in divorce and family for several years. Board certification entails a rather involved application and screening process and requires the attorneys to have extensive trial experience in their chosen field as well as completion of a written examination. Only six percent of all lawyers in Florida are board certified. Prospective clients can find board certified attorneys in their area by going to this link: http://www.floridabar.org/divcom/pi/certsect.nsf/certifications on the Florida Bar website.